We can move on, at last, from Cellular Respiration. Today we welcome a virtual respite from the intricacies of the cell. We’ve covered many things that account for what cells–the basic unit of life–are. Nevertheless, we cannot talk about biology without actually seeing the result of the pathways and structures we’ve discussed in the past months. These pathways, tissues, and biochemical structures, have many wonderful arrangements–organizations that give rise to organisms of elegant simplicity (sponges), and impressive complexity (humans). This respite comes in the form of a new chapter: Chapter 32: Introduction to Animals. Why do we study animals? Imagine an architect that only knows about materials, but has never seen an actual building; he or she does not know that marble, a material studied in detail, can be used to build structures like roman columns, or art pieces like Michelangelo’s Moses. Right now, at this stage of your Bio course, you are an architect that knows (or should know) all about marble, but has never seen a marble creation; you have heard everything there is to know about the cell–its stuctures, behaviors, biochemical pathways, etc.–but know nothing about one of the most impressive results of what cells can do. 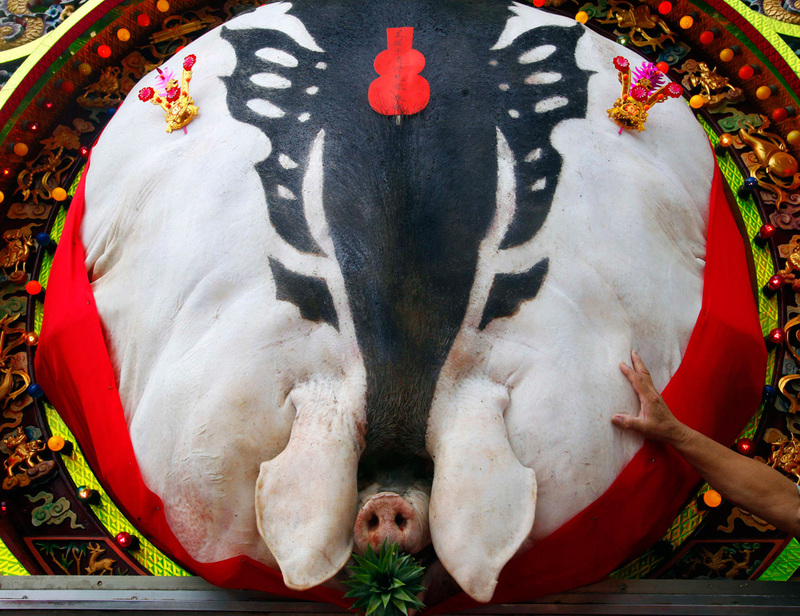 “A man stands in front of his fattened sacrificial pig as part of the Hakka Yimin Festival in Hsinchu, Taiwan on August 29, 2010. During the festival, believers worship ancestors who fought for the government against rebels during ancient times to protect their homeland. After their deaths, locals started sacrificing pigs as offerings during the annual Hungry Ghost festival to commemorate their bravery. The sacrifice begins with a competition for the fattest pig in town and the family that offers the fattest pig is believed to receive a great blessing.” Image by Nicky Loh. This entry was tagged animals, Chapter 32: Introduction to Animals. Bookmark the permalink. I know of place in the Caribbean were pigs are sacrificed, by the thousands, every year. I liked this post very much because I find animals and the large variety of them that can be found on this Earth very interesting and how new species are found each year. The last bit which mentions how animals have been a huge part of human culture I very much agree with since many species of animals that now exist are “man-made”, for example, dogs and cattle which have been selectively bred by humans for a long time forming new species with the purpose of them helping humans survive. Also, I feel bad for the pig, he probably can’t move or do anything, at first when I saw the picture I mistook it for a giant pillow. Many animals–such as cattle, pigs, dogs, etc.–were created by what Charles Darwin called artificial selection. The pig in the picture is the result of this. Remember that cultures all around the world have been killing animals for many reasons–here in Puerto Rico we have slaughtered millions of pigs for hundreds of years; a pig holocaust happens every holiday season. At least for me–and I’m not saying that I’m happy that the pig is being killed–I see this ceremony as a different way of humans interacting with this animal. In both countries, Puerto Rico and Taiwan, the slaughter pigs is a moment of joy and celebration. The picture speaks a thousand words. It is a beautiful image. Traditions are very important for many cultures around the world, especially for cultures in which animals play important roles. it is good to know how people keep memory for their ancestors, and to think how they got those pigs so fat is always a curiosity and a way to keep them in a diet to be so heavy, and survive. Cultures are as vast and different as species of animals. i am very curious of all the types of traditions people do and for them they believe its true but for others it is a lie because we all have different beliefs but actually non of them seem to be true because if you know about them non of them have actual proof that they are true. Your curiosity is very healthy. As I was telling you in class, cultures all over the world are the product of the human condition. Cultures, simply put, include religion, music, art, etc. They have been very important for many people: take the example of Chinese civilization, which has been around for almost 5,000 years. Science is different, though. Because it is a human activity that aims to explain the natural world, science is more practical than cultures (i.e. religion, art) when it comes to find truths. But that does not mean that cultures haven’t been important for the human experience. If it were not for religion, art, music, etc–they came before science and philosophy–we would not be talking about science today. Animals shouldnt pay for peoples weird costums .. I think no human would like to be offered to sacrifice by a pig.. That would be nice at all. I may understand its a tradition and its there way to view things but its wrong to take a pig and treat it so evil. Animals should have rights and also have there own feelings. what if you were that pig? what would you feel?! I don’t see much difference from what they do—once a year, to their biggest pig—and what we do; once a year as well but to thousands of pigs. In other words: «Nos jartamos de lechón en Navidades». The pig is huge, and it is a very special occasion. The whole village digs in. I imagine Christmas Eve in the early 50’s, in the puertorrican countryside… We have been doing more or less the same thing for centuries. Plus, pigs are delicious. I don’t find disgusting the fact that the pig is being sacrifice because of a tradition, but that families compete to see who can get their pig to the highest degree of obesity to receive a “blessing”. Although I can understand that it’s tradition and it’s part of their culture I find it unnecessary. It really wouldn’t be that difficult to find a more humane way to honor their ancestors. Sacrifices and religious rituals change with time. Lets hope—for the pigs sake—that their rites enter the 21st Century. At first i didn’t know what the picture was but the only thing that i could see was that it had a pig nose. I feel very bad for that pig because as i read the article this people use this animals so they can sacrifice for their god. Personally i believe that animals shouldnt be treated this way because they also have the right for life. Maybe they can also use another way to sacrifice. Its very curious and intresting the culture of others and the different believes and how others believe in different ways. For example, some people believe in their ancestors, other in one god, others in many gods. In this article we can see sadly, a poor fat pig that when he was alive he couldn’t even move or run but we have to respect their believes. Cultures say a lot about who we are. This may be seen as another prey/predator relationship, but with a lot more ritaual and theatricality. Human beings are predators. There’s beauty in ancient rituals. Although they are ancient beliefs, i think its wrong to sacrifice animals. Since part of their culture I respect them and what they need to do for a blessing. Customs and traditions change with time. Some are more preserved than others. Very old traditions that serve to preserve the memory of those who came before. A centuries old ritual is very hard to leave behind. I agree with this argument, Agustin. If we can respect all cultures, a lot of unnecessary wars can be avoided. Cultures change their perspectives every decade. For example, the brutality that bulls suffer every year in bullfights in Spain will probably diminish in the next decade or so. People are starting to get fed up with the abuse—and reasonably so. Ancient beliefs are important to every culture. Its interesting how some rituals proven not to work, don’t change out of culture. I think it’s good that they do this because they keep in touch with their ancient roots but at the same time your killin g an innocent animal. Why do they keep doing these rituals if they know they don’t work? Rituals like these are done to honor their ancestors, to honor their traditions ; rituals that are older than most countries in the Western Hemisphere of the planet. what a contradiction…the killing appears to brings joy. Impressive to see how people in holidays (for example christmas) can make a masacre of pigs for a family gathering. Practically celebrating life with death. Most see it as food, some as a sacrifice and others as an organism that just like humans, feel and have a right to live. Its interesting to see what cultures do, but its not right to sacrifice animals. The more we know about human cultures—through a field called anthropology—, the more understanding we are of their rituals. this is weird because they keep in touch with ancestors by killing a huge pig even though its their culture they are killing an animal probably for them its no big deal but for the pig and other people with different cultures it might be. Wen it comes to different cultures, many things are relative to their context. We must remember that everyone has a unique vision of the world. I encourage you to Google the word «totem». I believe it will enrich your already lucid view. Beautifully put, Andrea. The quetzal bird is beautiful. Through this semester we have seen a lot of small individuals parts that form one whole. Its amazing when you can see and fully understand how all those small parts like organelles form a bigger more complex structure like the cell, but it is even cooler to see how all those organs and parts build up an organism like animals.Animals are extremely complex organisms. For years humans have been considered the smartest “animal” alive, because of our complex living styles and our influences on nature. This view of superiority is incorrect. Its has been proven lately that animals are equally smart that the humans, some could be considered smarter. Humans poses different abilities and they have a different kind of intelligence which humans had taken for granted for many thousands of years. This is especially true of dogs, which, without speech, can express very clearly if the are hungry.